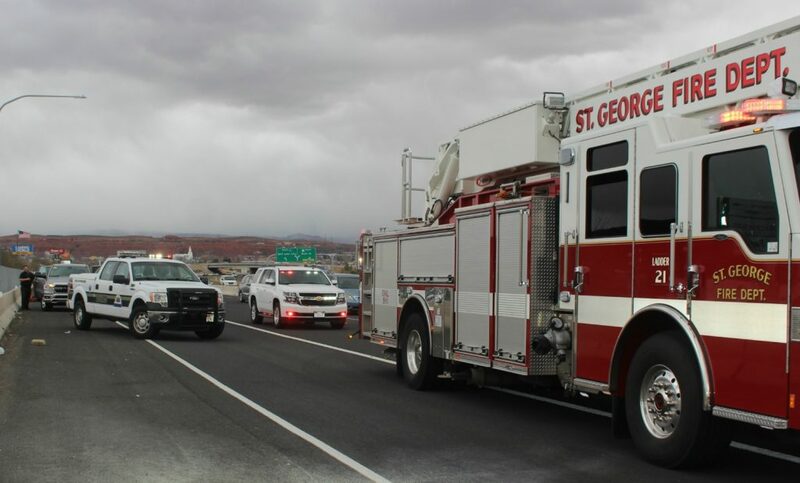 ST. GEORGE — A couple escaped injury after their vehicle caught fire Friday on Interstate 15 less than a hundred feet from the Dixie Drive off-ramp while employees witnessing the blaze from Stephen Wade came to the couple’s aid. 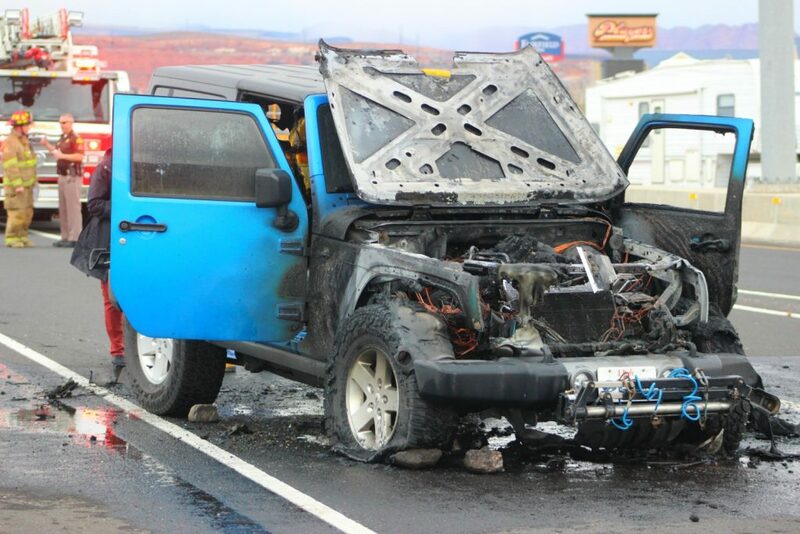 At 1:45 p.m. firefighters and emergency personnel responded to southbound I-15 near Exit 5 where they found a blue Jeep engulfed in flames and the two occupants on the emergency shoulder. Firefighters were able to quickly extinguish the blaze while Utah Highway Patrol Sgt. Jake Hicks spoke to the Davis County couple who were visiting Southern Utah for a day of shopping. 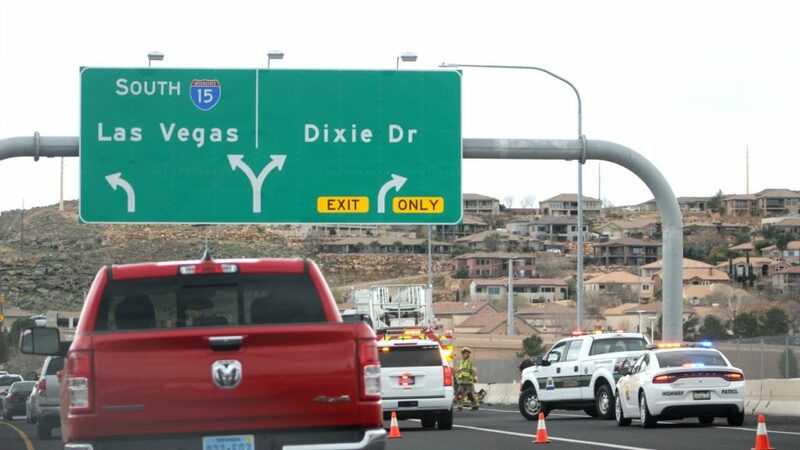 Seconds after the Jeep entered the Bluff Street on-ramp to head south on I-15, Hicks said, the driver heard “a loud pop” and saw smoke coming from the vehicle, which began to malfunction. The driver pulled to the right and after putting the car in gear she pulled the emergency brake and turned the engine off. The couple grabbed what items they could, got out and moved away from the vehicle as smoke started billowing from the undercarriage. Flames were visible seconds later and quickly spread toward the engine area when “all of a sudden” the Jeep began to move forward, either due to “the fire activating the ignition possibly or from some other cause,” Hicks said after speaking to the driver. The couple quickly placed large rocks in front of the wheels to stop the Jeep from moving after several employees at the Stephen Wade automobile dealership witnessed the incident and threw the rocks over the fence. “There were also employees over there who saw it and came around with their truck to help the couple,” Hicks said. Two employees from the dealership, Justice Brown and Matthew Kintigh, drove around to the scene and helped load the couple’s things into a pickup truck and provided a place for them to sit until the tow truck arrived. The vehicle was destroyed in the fire and was towed from the roadway. 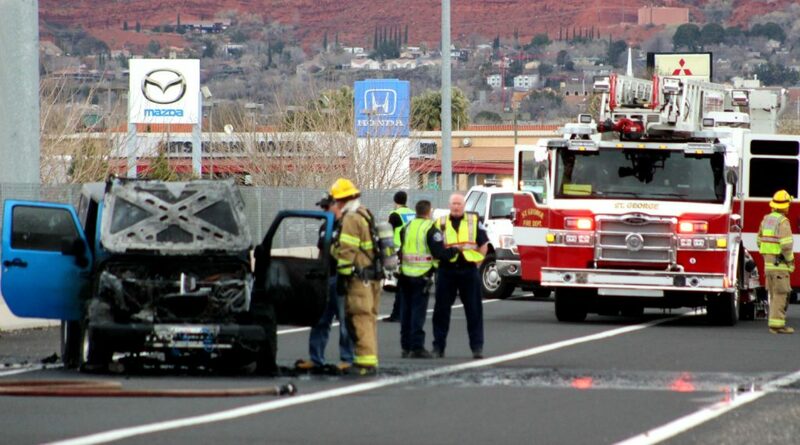 Southbound traffic on I-15 was moderately impeded while responders tended to the scene.